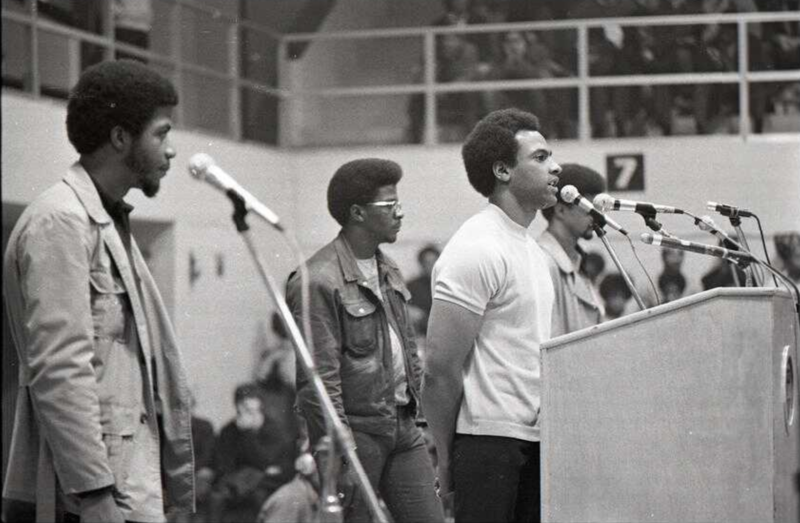 In 1970 Huey Newton gave a speech at Boston college outlining a new ideological direction for the Black Panther Party, Revolutionary Intercommunalism. Newton described his rejection of the idea of black people being an internal colony in the US, that class struggle rather than national liberation was the only route to a communist society (describing the failure of liberation movements in Africa as 'neo-colonialism'), concerns around automation and the working class, and the impossibility of a socialist state in the US (against the position of the Progressive Labor Party), although he still described Vietnam and China as partially liberated. I think that the mistake is that some people have taken the apparent as the actual fact in spite of their claims of scholarly research and following the discipline of dialectical materialism. They fail to search deeper, as the scientist is required to do, to get beyond the apparent and come up with the more significant. Let me explain how this relates to the Black Panther Party. The Black Panther Party is a Marxist‐Leninist party because we follow the dialectical method and we also integrate theory with practice. We are not mechanical Marxists and we are not historical materialists. Some people think they are Marxists when actually they are following the thoughts of Hegel. Some people think they are Marxist‐ Leninists but they refuse to be creative, and are, therefore, tied to the past. They are tied to a rhetoric that does not apply to the present set of conditions. They are tied to a set of thoughts that approaches dogma ‐ what we call flunkeyism. some surviving Africanisms, but by and large you can see the transformation which was achieved by time and the highly technological society whose tremendous mass media functions as an indoctrination center. The ruling circle has launched satellites in order to project a beam across the earth and indoctrinate the world, and while there might be some cultural differences, these differences are not qualitative but quantitative. In other words, if technology and the ruling circle go on as they are now the people of the world will be conditioned to adopt Western values. (I think Japan is a good example.) The differences between people are getting very small, but again that is in the interest of the ruling circle. I do not believe that history can be backtracked. If the world is really that interconnected then we have to acknowledge that and say that in order for the people to be free, they will have to control the institutions of their community, and have some form of representation in the technological center that they have produced. The United States, in order to correct its robbery of the world, will have to first return much of which it has stolen. I don’t see how we can talk about socialism when the problem is world distribution. I think this is what Marx meant when he talked about the non‐state. Interesting read and it struck me that this represented a potential transition in the politics of the Black Panthers away from what today might be seen as a form of 'Identity Politics' towards a more class based revolutionary one? @SpikeyMike so sort of, but I think there's been an over-emphasis on cultural nationalism/separatism in the Black Panthers altogether. I'm not exactly an expert, but I think you had a revolutionary socialist tendency all the way through, and then there was crossover with cultural nationalists, and it took 2-3 years to shake out exactly who was who between about 1966-1968 - (which is not really that long think about the Novara trajectory towards social democracy since 2014...). Kwame Ture was a member of the Panthers in 1967-8, but he'd left when he moved to Guinea (participated in Sekou Toure's government, later worked with Kwame Nkrumah in Ghana) and published an open resignation letter to the BPP in 1969 where he denounced the 'party line of alliances with white radicals' - I can't find that letter online though. The 'internal colony' analysis mentioned by Newton persisted right through to the Black Liberation Army - Assata Shakur, Kuwasi Balagoon, mainly on the East Coast. You could broadly call the internal colony/semi-colony stuff Maoist, the people who persisted with that were profoundly anti-electoral though and mostly ended up in prison. I wouldn't call it 'identity politics', there are versions of it which are completely opposed to nation states as well so not inherently nationalist either. Thanks for that useful follow-up - I suppose it is often the case that individuals find it easier on reflection to move away from forms of 'Identity Politics' towards a more independent revolutionary class struggle form of politics than it is for whole organisations. I don’t see how the Black Panthers, who rejected cultural nationalism and made alliances with multiracial socialist organizations are ‘identity politics’ but various white radical organizations, who draw inspiration almost entirely from historical European figures, writing, history and imagery are not a form of identity politics. Maybe both to one degree or another - rather depends what organisations you refer to and what periods of history or stages of development of those organisations. If you read accounts of the formation of the Panthers - eg, Bobby Seale's 'Seize The Time' - you'll see that it was formed as a more relevant alternative to the black cultural nationalists on campus who were seen as existing in a detached intellectual "ivory tower". Projecting current categories onto the past is problematic but the black nationalists privileged cultural identity over class relations, seeing all whites as the oppressing enemy to be combatted by cultural separatism - an 'identity politics' the BPP founders Seale & Newton rejected. Just looking at the various quotes from leading panthers on class/race I think it's clear that the had NOTHING to do with modern identity politics. They used the language of nationalism in their early years, but that was the language of the times - and as this transcript shows they'd totally rejected it by 1970. Identity politics in it's modern form, with it's privilege checklists and guilt trips, seems to have come from white academia than any grassroots anti-racist movement. Some of the best black writers I've read may use the terms, but undermine the assumptions the whole thing is based on. See how bell hooks' talk in "feminism is for everybody", or the obvious conclusions that the The Combahee River Collective Statement would imply - if any "intersectionalists" actually read it. The term 'white skin privilege' comes out of the work of Theodor W Allen and some other critical race theorists like Noel Ignatiev, usually Du Bois gets credit for 'psychological wage' of whiteness. So, not to say no-one in academia has written about it, but some of the major people weren't academics. This is extremely different to Penny McIntosh's "White Privilege: unpacking the invisible knapsack" which is where most critics of 'privilege theory', and some people who like it, tend to start. Even on it's own terms - listing specific personal experiences that describe white privilege as it's constructed socially or something - that essay is not very good; it ascribes several experiences to being white that are really social class like being able to buy a house in any neighbourhood you want. The problem is people rarely say which of these they're talking about, which would be like if every time someone mentioned marxism piping up with "Oh you mean Enver Hoxha!!". While the Huey Newton speech says they've rejected nationalism, there's still some stage-ism by calling Vietnam, China, Cambodia and North Korea 'liberated territory' but I don't think there's enough detail to really examine this (i.e. views on class conflict within those countries). Also while we can distinguish between the BPP and 'modern identity politics' here, the speech itself talks about cultural nationalist and black capitalist politics in the '60s, there were earlier examples like Booker T Washington too.